When my Hubby and I were married we were given a Quesadilla maker. I know sounds kinda silly right? Well to be honest it is. I have used it a few times over the years, but it never gave me that authentic perfectly browned and crispy quesadilla that I longed for. Living in the Southwest it's not hard to get real Mexican food, and one of my favorite restaurants here seriously serves the BEST quesadilla's I've ever had. 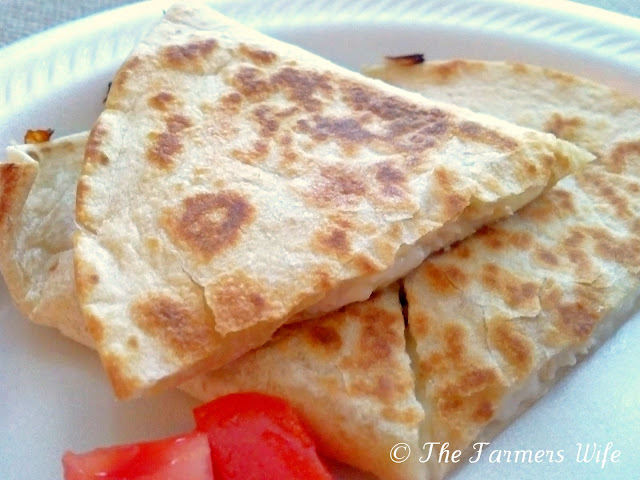 And recently after meeting a friend for lunch there I ordered those fantastic quesadilla's and decided I was finally going to figure out how to make them myself. And I did! To be honest my favorite quesadilla has steak in it, because it's just so darn good... lol! But I don't typically keep steak around my house so when I make these I usually use chicken which is still yummy. The great thing about these is you can really make them to order based on each member of your families preferences. For instance my son likes the standard chicken and cheese only, but my hubby and I like them more loaded with tomatoes and green chilies and onion... Yum! Man I'm getting hungry... lol! I hope you'll give these a try sometime soon, they are so simple for a lazy weeknight but are also so very tasty! Prep all your ingredients, chop all the veggies you want and chicken and set aside. Then heat a 12+ inch skillet on medium-high heat and spray with cooking spray. Once hot place one tortilla down and start adding your fillings half the cheese first, then chicken and your choice of toppings, then top with the remaining cheese and top with second tortilla. Using your spatula press the top tortilla down a bit then cover the pan with a lid or foil. Cook for about 2-3 minutes until cheese is melted and the bottom side is browned and crunchy. Then very carefully flip over and cook the other side another 2-3 minutes. Once your cheese is all melted (covering with a lid helps melt the cheese faster) and the top and bottom are browned and crunchy remove from pan and let sit for a minute before cutting into wedges. Serve warm with your choice of sides, sour cream, salsa, guacamole etc. I know this isn't an overly impressive recipe, or difficult by any means. But sometimes I think the simplest recipes are the best to have in your arsenal! We love these and I make them often as they are easy to throw together and taste so very good! 4 stars. I adore quesadillas, but never think of them when trying to plan my dinner menu. I'm going to make these soon...so easy and delish!! !